When it comes to your home, the front door may not occupy a lot of space, but it does play a huge role. You want your front door to fit in with the rest of your home’s aesthetic, but you also want it to be a focal point that stands out a bit too. As the component in charge of making first impressions, it makes sense to take your time when picking one out. Here is some helpful information to guide you. Let’s begin by considering the material your door will be made of. This may be the most important choice you make. While the style you go with is certainly crucial, at the end of the day, your door is first and foremost a functional piece. You need one that can stand up to the elements, including what the sun will throw at it if you don’t have an adequate overhang protecting it. To some degree, too, you want to think about a door that will help keep intruders at bay, even if we’re only talking about vermin. These days, just about any material you can think of is available. If you want to spend the money and wait for two to eight weeks, you can get a custom door made from a wide range of them. Obviously, glass serves as a window and is never meant to be for the entire door. Although, it can occupy a large space when combined with wrought iron. Of all your options, wood is by far the most popular, due in large part to how versatile and beautiful it is. Plus you’ll have plenty of options where types of wood are concerned (e.g. oak, cherry, pine, maple, etc.). Wrought iron doors are often chosen by those who put a priority on security and durability. It will take a lot to damage one of these doors and normal wear and tear is easily repaired. These doors can also be extremely beautiful, with intricate designs playing against glass. 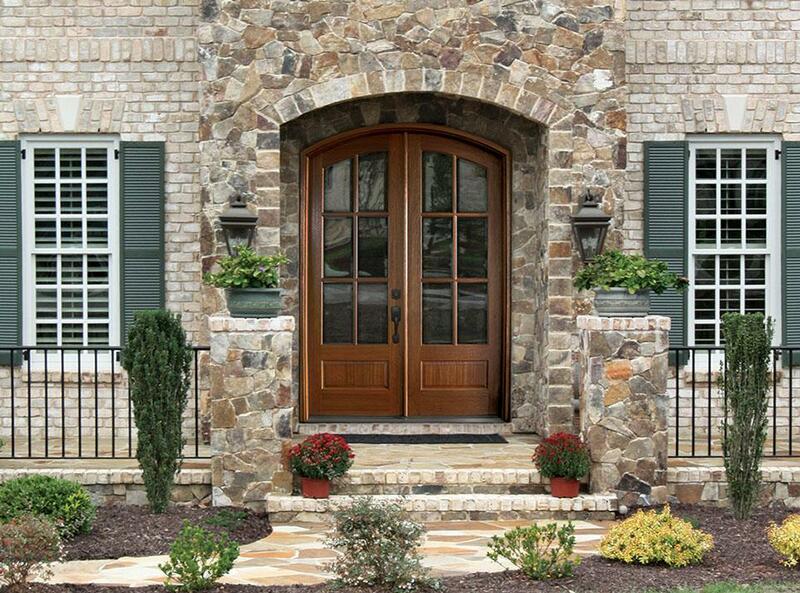 Fiberglass doors are actually composites of different materials. They’re not only durable, but they also involve little-to-no maintenance. If you live in a harsh climate or one that is especially humid, this material is a great choice. Plus, fiberglass doors look like wood ones right down to the grain and texture, so you don’t have to lose beauty points. Whether you’re simply replacing a door or building a home from scratch, you want the front door to fit in with the rest of the structure’s style. One easy way to do this is to find other homes with similar styles and look at the type of door they chose. It’s easy to pick almost any color door, but traditionally they tend to be black, blue, white, brown, red or left a natural shade. Again, it helps to look at other homes. As with any purchase, you need to think about how much a door will cost you. This will definitely affect the type of material you use, though it may not necessarily impede your style too much. However, when it comes to budgeting for parts of your home, you also need to consider the long-term costs involved. Buying a wood door will involve different upkeep costs than a wrought iron one. So be sure you’re clear on what kind of money you’ll need to spend going forward. To some people, this may seem like a lot of work just to choose a front door, but you’ll be happier with the results if you invest some time and energy into the process.